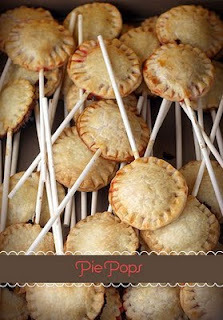 The blog entitled, "Luxirare: Killer Clothes + Fine Cuisine" has started a pie revolution... Pie Pops! The photo (left) features pie pops from another food blog, "Bakerella" (Aug. 2, 2009). All you need is pie dough, filling, lollipop sticks... and a litte (a lot?) of patience.